The Witches of Mendocino Court Files is now available to download. It has been compiled into a single 83 page PDF. CieloDrive.com has graciously agreed to host the document. Thank you so much for hosting this file Cielodrive!!!! Wow, whoever wrote that report on Susan Atkins noticed she had the potential to be harmful. I forgot how they worded it, but it was something along the lines of her being okay at the moment, but she had the potential to do harm. That, right there stood out in my mind. Susan was a very, very damaged girl. Wow, it's so incredible to actually have access to all these original documents. Very interesting. Thank you! 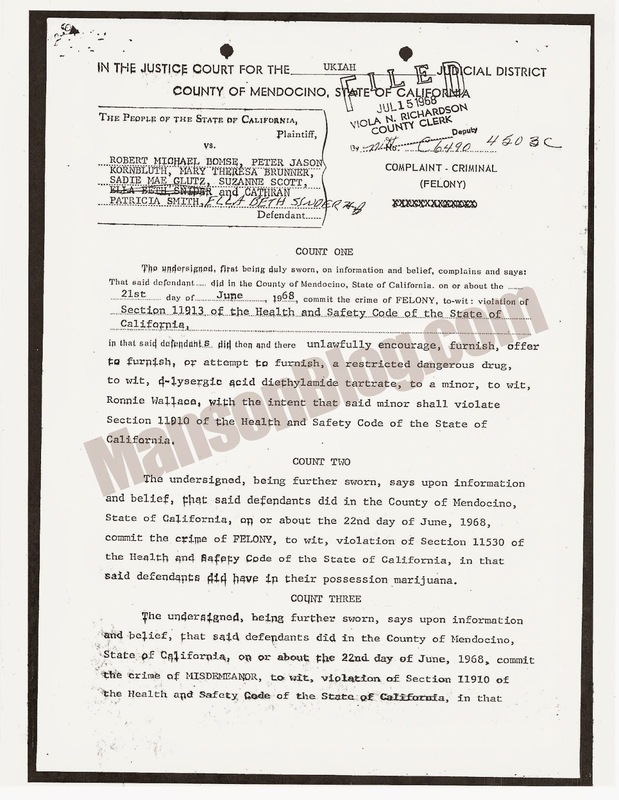 One thing I noticed when reading the files is that when the women were released on their O/R they signed the form and put Hopland as their town of residence. I have never heard Hopland mentioned before relative to the Family. It was in either Sanders or Bugliosi that the women were staying on the Boonville Road while awaiting the disposition of their case. Hopland is a small town on Hwy 101 very near the Mendocino and Sonoma County line. I wonder what friend of the Family lived there??? One doctor, Carl Aagaard, was a pathologist and the other, Paul Marsh, was a general practitioner. Marsh, a few short years later, was suspended from practicing medicine due to multiple malpractice lawsuits. saying that Ella Jo Bailey had been released on her O/R to undergo surgery but the subpoena has Suzanne Scott aka Stephanie Rowe as the defendant the doctors were suppose to being testifying about. Weren't there some unsolved crimes in that area while they were in residence in that particular county, or am I thinking of something else? I believe you are thinking of the Clyda Dulaney and Nancy Warren murders which happened October 13, 1968. We have filed a few reports on those murders. From what I can tell looking at these documents the women were pretty much done with their court appearances and other legal obligations by September 19th 1968. What you can not tell by the documents is if they all went back to southern California or hung around for another three or four weeks. The Mendocino County Sheriff did treat the Family as suspects for the Warren/Dulaney murders in the early days of their arrests for the TLB murders but they were ultimately cleared. I should add that one thing we don't know for sure is when Michael "Pooh Bear" was returned to Mary Brunner. That information is not available because it involves a juvenile. We do know that Roger Smith and his wife were made the foster parents and that they lived in Marin County. Roger Smith was Manson's federal parole officer. It is conceivable that getting Pooh Bear back may have taken another few weeks.